Morse code on the flashing light. 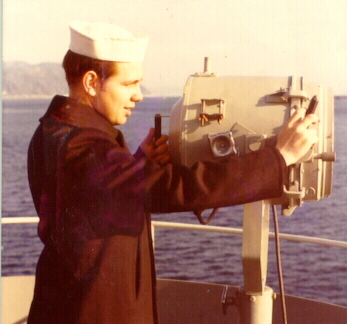 I was a radioman on the U.S.S. Alamo LSD-33, and a proficient morse code operator, so I enjoyed chatting with the signalmen on other ships. I joined the navy on 13 June 1972 and was released from active duty on 25 May 1976. I spent 14 weeks in radioman "A" school, and 9 weeks in teletype maintenance "C" school. My first duty station was at the navy radio station (callsign: NPN) Finegayan, Guam where I was a morse code communicator. That was loads of fun. I "worked" lots of "merchant ships" as well as our submarines. While I was studying teletype repair in San Diego, I went ahead and qualified for specialty number 2342 morse code proficiency, which required 22 words per minute receive on a manual typewriter. The highest speed code requirement ever required for an Extra class amateur radio license is 20 words per minute, that requirement has been reduced to 13 w.p.m. When I was in the navy I planned to become a merchant marine radio operator when my enlistment ended, but although I got a merchant seaman's "Z" card from the U.S. Coast Guard, I never got a commercial radio license and took up welding instead. That's a good thing because morse was dead just a few years later.